On this page, I’ve put together a list of the best resources for a low FODMAP diet. You will find downloadable low FODMAP charts, free diet guides, and great book recommendations. Enjoy! And if you have further stuff you want to share, please let us all know by commenting or contacting me. I appreciate this very much! A low FODMAP diet is a diet low in fermentable carbs, which are also known as FODMAPS (Fermentable Oligosaccharides, Disaccharides, Monosaccharides, and Polyols). These FODMAPs can be poorly absorbed by some people and cause symptoms of Irritable Bowel Syndrome (IBS) in the following. A low FODMAP diet is an effective treatment for IBS, but also for fructose malabsorption, as fructose, fructans, and sorbitol belong to FODMAPS. It’s basically a fructose malabsorption diet with more restrictions. A nice 3-page chart showing foods with low or high FODMAP content of the following categories: vegetables and legumes, fruits, meat and substitutes, breads cereals grains and pasta, nuts and seeds, milk, dairy and eggs, cheese, condiments, sweeteners, and drinks. A handy chart showing on one page foods that are suitable on a low FODMAP diet and foods that contain FODMAPs, and therefore should be eliminated. This chart is perfectly suitable for printing out and pinning on your fridge. A great FODMAP food chart comparable with the one from the IBS Self Help and Support Group. This 1-page chart lists common foods containing specific FODMAPs and foods that are suitable on a low FODMAP diet. This nice 8-page table breaks foods into 4 different ranges of FODMAP content (low-moderate-high-illegal) based on vegetables, fruits, legumes and beans, nuts and seeds, dairy, protein and meats, sweeteners, beverages and alcohol, fats and oils, and seasonings and condiments. Using this food chart, you will see which foods are less or more fermentable. This 3-page guide from Stanford University provides an overview of what FODMAPs are and what the low FODMAP diet is, and it gives you a 1-page table of low FODMAP foods based on different food categories (meats, poultry fish, eggs, dairy, grains, fruits, vegetables, desserts, beverages, seasonings, condiments). There are also tips for following the low FODMAP diet, as well as meal and snack ideas. You can download this guide for the low FODMAP diet from Stanford with the link below. A nice 4-page guide comparable with the low FODMAP diet guide from Stanford. 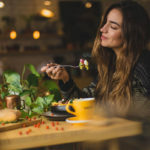 Besides giving basic information about FODMAPs and the low FODMAP diet, this guide also talks about testing for poor FODMAP absorption and the barriers to follow this diet. Another great part of this document is the provided low FODMAP diet sample meal plan. 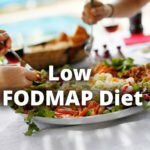 This is the most detailed low FODMAP diet guide, I have found as a free download. It provides you with the information of the other guides, plus a 4-page low FODMAP food table, tips for dining out on the low FODMAP diet, and a tracking journal. Do you know further useful resources? Let us know!